I have great respect for solo protesters. They usually aren't protesting something. They are there to warn. It's prudent to take them seriously because they may be seers, people with ability to sense a future. People with prophetic ability exist but we don't know how to recognize them and usually ignore them. They operate in a different place. To understand what President Donald Trump will mean for Guam and the region, for now, requires a seer. Trump's defense rhetoric is loud, oversized and shallow. In a very short, less than 30-second, video, he released during the campaign, Trump says a number things, including: "I’m going to make our military so big, so powerful, so strong, that nobody — absolutely nobody — is going to mess with us,” said Trump. As president, Trump will be told by by the Pentagon that Guam and CNMI, in particular Pagan and Tinian, are critical to establishing military might in the region. Somehow, I can't imagine Trump exploring the impact of this increase militarization on the indigenous people of Guam and CNMI, but for now, let's give him the benefit of doubt. While we don't know what Trump will do, there are several things that Trump may take quick action that may signal how he will treat Guam. The first early indicator is this: How will Trump treat the Native Americans protesting the North Dakota Access Pipeline? Some 5,000 people have established three camps to protest this pipeline, and tensions are likely to remain high. The U.S. has ordered the protesters to leave by Dec. 5, but they have vowed to stay. This will remain an issue for the Trump presidency. In Arizona, Native Americans have been fighting mining development on land, Sacred Oak Flat, sacred to the Apaches. A rider in a 2015 legislation opened this area for mining development, but the protest appear to have succeeded in putting this project on hold. Will Trump open this area to mining? Many Native Americans, as well as many people worried about climate change, have opposed by Keystone Pipeline. Citing climate change, President Barack Obama rejected the Keystone pipeline. These projects are, for President Trump, questions. Will Trump hear the concerns raised by the pipeline and mining protestors or the business interests? If Trump approves these projects, over the concerns raised by Native Americans and environmentalists, it's probably fair to say that he will give little, if any, attention to people of Guam and CNMI over militarization. 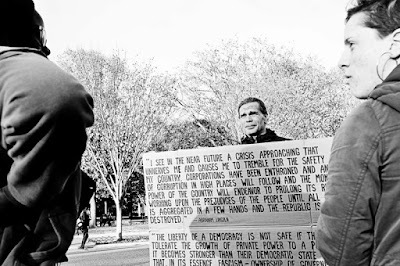 The person with the signs above was in front of the White House in 2014. This was well before the age of Trump. 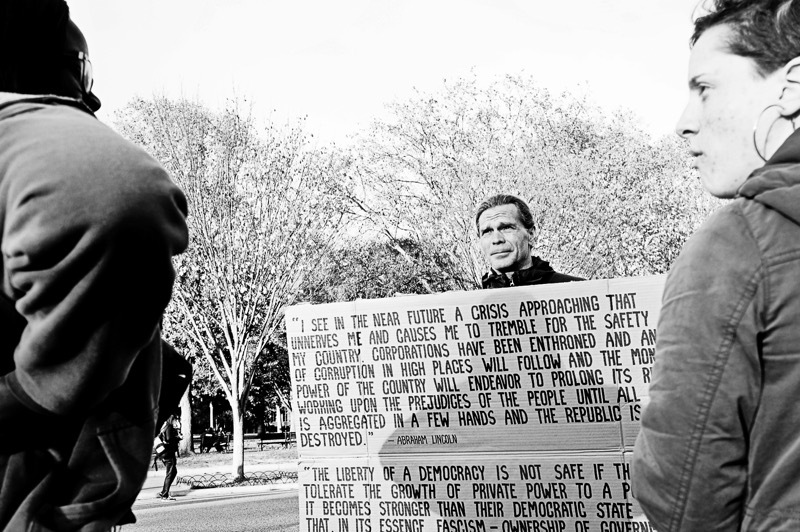 I happened by and took some photos, but don't remember what he said. But his sign includes severals quotes, carefully lettered in black ink on cardboard. The photos only show the first two. "I see in the near future a crisis approaching that unnerves me and causes me to tremble for the safety of my country. Corporations have been enthroned and an era of corruption in high places will follow and the moneyed power of the country will endeavor to prolong its reign by working upon the prejudices of the people until all wealth is aggregated in a few hands and the Republic is destroyed." - Abraham Lincoln. The second was from Franklin Delano Roosevelt: "The liberty of a democracy is not safe if the people tolerate the growth of private power to a point where it becomes stronger than their democratic state itself. That, in its essence, is fascism—ownership of government by an individual, by a group, or by any other controlling private power."